The Saskatoon Flag Shop specializes in flags of the world, custom sewn flags, banners, and windsocks. We encourage you to bring us your company or group logo and let us prepare a custom quotation for you. Why not always "FLY HIGH" above the rest! There's a lot more to than flags! If you need Banners, Windsocks, Vinyl Signage, National Pins, Crests and Decals, we have them all and all flag-related products. 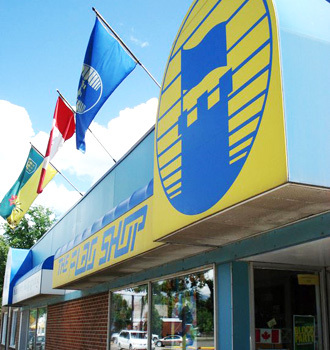 Come visit our Saskatoon Flag Shop in Saskatchewan and we would be happy to assist you. Check out our Products page for some of the unique products available at The Flag Shop Saskatoon in Saskatchewan. Looking for Saskatchewan flags? Contact us or shop online! 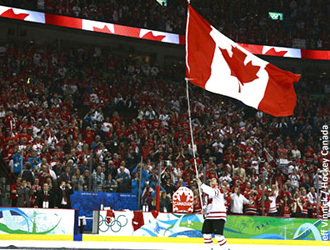 The Canada flag, carried by Sidney Crosby and Roberto Luongo after Team Canada won the gold medal in Men's Ice Hockey during the Vancouver 2010 Winter Olympic Games, was purchased at the Saskatoon Flag Shop in Saskatchewan. The Olympians borrowed this flag from one of our customers who was sitting in the audience behind the US bench with this large Canada flag on a telescopic pole. It was a proud and memorable moment. Now a Flag Shop flag is part of the Hockey Sports Hall of Fame!